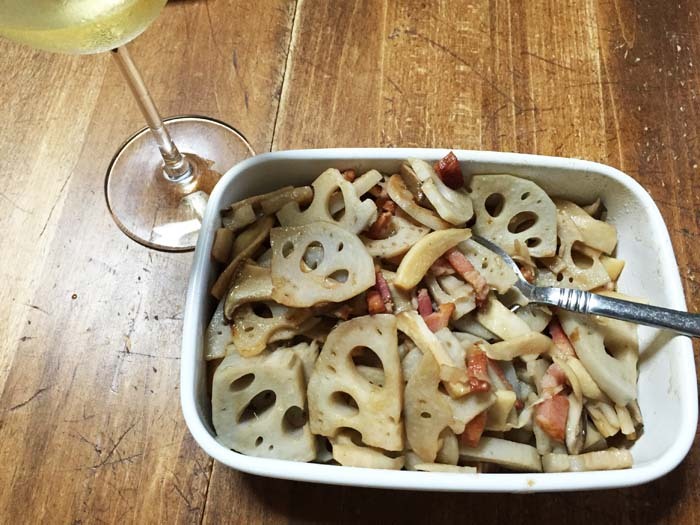 Have you seen a lotus root in a Japanese market and wondered how to use it? This is one of my favorite ways to cook the lotus root. The lotus root doesn’t have a strong taste itself but it’s crunchy and soaks up a sauce really well. Heat olive oil in a pan and cook the bacon, add the eryngi mushrooms and cook until they soak up the oil and become soft. Add lotus roots and salt. Mix well and heat about 3 minutes. Add balsamic vinegar and mix well.